Here is a real-life case related to a failed development project that we are attempting to take over. KW CRECO was assigned the task of working with attorneys to clear up the title. The developer of a mid-sized housing tract went under and walked away from the project prior to completion. Before the developer’s insolvency was made known, the Carpenter had completed the framing of all homes at the request of the General Contractor. Before the Carpenter’s work, a "Site" subcontractor had leveled and graded the property; a "Foundation" subcontractor had put in the foundation; a "Survey" subcontractor had staked out the driveways and homes, and a "Plumbing" subcontractor had partially installed the plumbing fixtures. All parties properly served a preliminary notice. A construction mortgage was filed on August 1, 2014. No one has been paid, and all subcontractors had filed liens by December 1, 2014.
Who has priority, the mortgage company or the lienors? What order of priority exists among the lienors? What happens if there is not enough money to pay the lienors? What is the fairest workout and why? A construction mortgage has a priority claim over any subsequently filed encumbrances and security interests in a property. In most instances, the timeline of events dictates the priority of claims against a secured property. The first party to file documents of record with the County will take precedence over subsequently filed mechanic’s liens. Among other things, this affords lenders the ability to view the title to property before granting a loan on the property. There is, however, an exception to this precedent when mechanic’s liens are recorded against a property. As to mechanics’ liens, however, there is sometimes a strange exception to a lender’s assumed lien seniority. In cases where a contractor’s work commences before the lender’s deed of trust is recorded, the mechanic’s lien may retroactively revert or “relate back” to when the work began – seniority is not restricted to the point at which the contractor realizes monies are owed, and a lien is formally recorded. Therefore, a claimant dispute may arise because at the time the lender viewed title to the property, the right to a mechanic’s lien may have existed but no lien may have yet been recorded. In these instances, the lender will have no notice that it may already be taking the second position in the property’s security. Although this may put banks at a disadvantage, it preserves the rights of the contractors conducting work and providing services for the property. Think about it this way. What if a contractor began working on the project slightly before the deed of trust was recorded. Then, upon numerous delays and arguments, that contractor determined the best course of action was to file and record a mechanic’s lien on the property. In this instance, the contractor’s lien has priority over the deed of trust and will be fully paid via a foreclosure sale before the senior lender receives any repayment. The contractor’s actions related to the property predate the lender’s actions, regardless of actual filing dates. An eye opener, perhaps, but courts have upheld this throughout the country. Although seemingly straightforward, the facts of the presented case establish additional complications given that the subcontractors did not include commencement dates in the filing of any recorded liens. These subcontractors only recorded the dates of completion. Because the site work was completed on the same date that the construction mortgage was filed, it was safe to assume that the work commenced prior to that date – giving the Site Contractor priority over the mortgage lender. Without additional information, only assumptions can be used to establish seniority among secured parties. Still, even the Carpenter (who finished work on the property as it spiraled into default) has a proper and valid right to record a mechanic’s lien against the property because it was engaged in work by the property owner’s authorized general contractor. Although entitled to a lien on the property, it’s seniority over the construction lender may be greatly hindered by the time at which the framing work commenced. The presented case highlights a significant component to the evaluation as to the order of priority interests against a property because it outlines a scenario involving multiple mechanic’s liens. When dealing with multiple valid mechanic’s liens against the same property, there is no priority between them – they are all on parity with each other regardless of when work commenced or when lien notices were filed. Likewise, mechanic’s lien claimants share pro-rata in the proceeds from the sale of the subject property regardless of when each mechanic’s lien was recorded as the later recorded lien enjoys a “relation back” to the first work performed on the project. However, would the Site Subcontractor’s commencement of site work prior to the recordation of the construction mortgage entitle all subsequent contractors to enjoy a senior lien on the property? This may vary on a state by state basis, but generally, multiple mechanic’s liens only share parity among each other if a common position is shared. Therefore, the scenario presented in the case would provide for the Site Subcontractor to have priority over the construction mortgage lender, and then all subsequent contractors would have a shared junior position. What would happen if the General Contractor filed a single mechanic’s lien that encompassed all of the amounts owed to various subcontractors? Would all of the parties then benefit from the commencement of the site work prior to the filing of the construction loan? Although seemingly unjust, general laws of foreclosure dictate that the most senior lien holder would be provided with all proceeds from the sale of the property until the point at which it is paid back in full. However, many instances provide for subrogation and other agreed upon provisions to supersede general foreclosure statutes concerning distribution of proceeds so that legal and foreclosure actions are not duplicated among all lien holders. Ideally, the construction lender would repay all contractors and abate any and all mechanic’s liens. Given that the lender had originally contemplated the payout of foreclosure proceeds as a possible outcome of the contract, it had previously assessed the risk of property valuation against the funds being lent to the borrower. Moreover, the work contributed by the subcontractors presumably increased the value of the property, thereby increasing the monies that may be collected by the senior lender via a foreclosure action. Perhaps the property’s value will not increase dollar for dollar but why should the senior lender be the exclusive beneficiary of these improvements? Aside from the fraudulent use of loan proceeds by the Borrower, the construction lender would be in no worse position if it were to pay off each mechanic’s lien. The contractors were most likely never given proper information or opportunity to assess property valuation, nor any possible foreclosure proceeds, at the time that they provided work and services. Each contractor entered into the contract with intentions of just compensation for work, not like the compensation related to prospective proceeds in the event of foreclosure. Conversely, the property’s security (vis a vis its valuation) was most likely the primary evaluation contemplated by the construction lender at the time the loan was issued. Fair or not, professional and experienced contractors must be aware of the details and intricacies of mechanic lien laws to protect against non-payment by the property owner. Brad Kuskin and KW Commercialwork closely with banks throughout Southern Florida to maximize repositioned value of failed development projects. 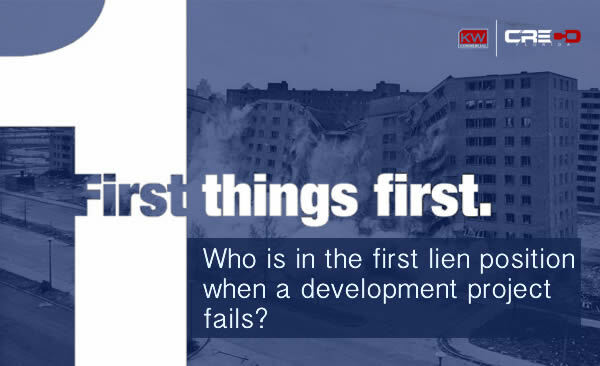 Contact KW CRECO if you would like more information on taking over failed development projects.